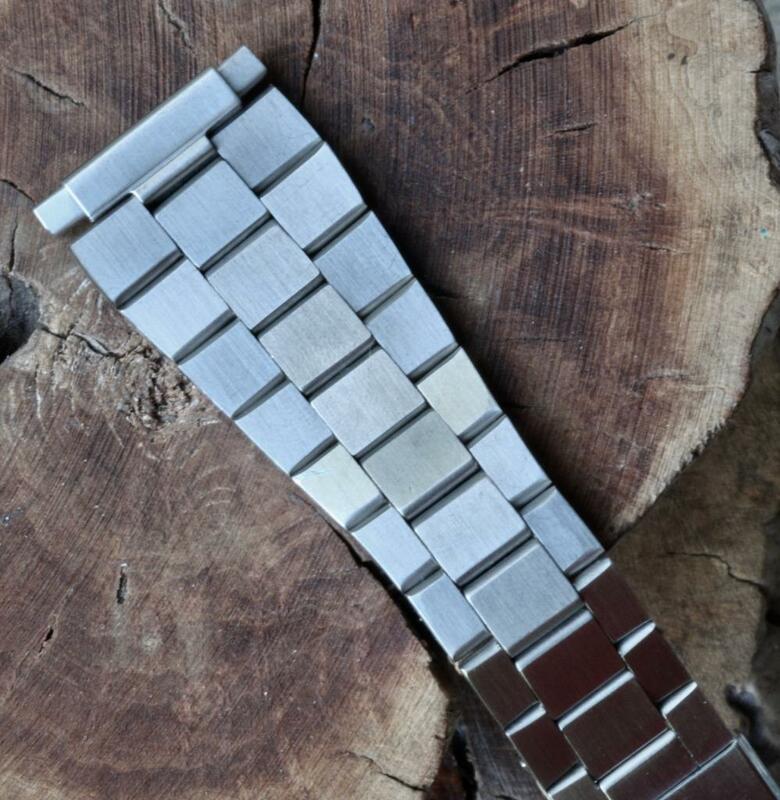 This is a rare configuration 1960s/70s New Old Stock flat-link watch bracelet in folded satin-finish stainless steel that is the perfect finishing touch for a large Heuer Calculator vintage chronograph model. This band has spring-loaded 22mm wide ends (these will be hidden under the case of the Calculator). 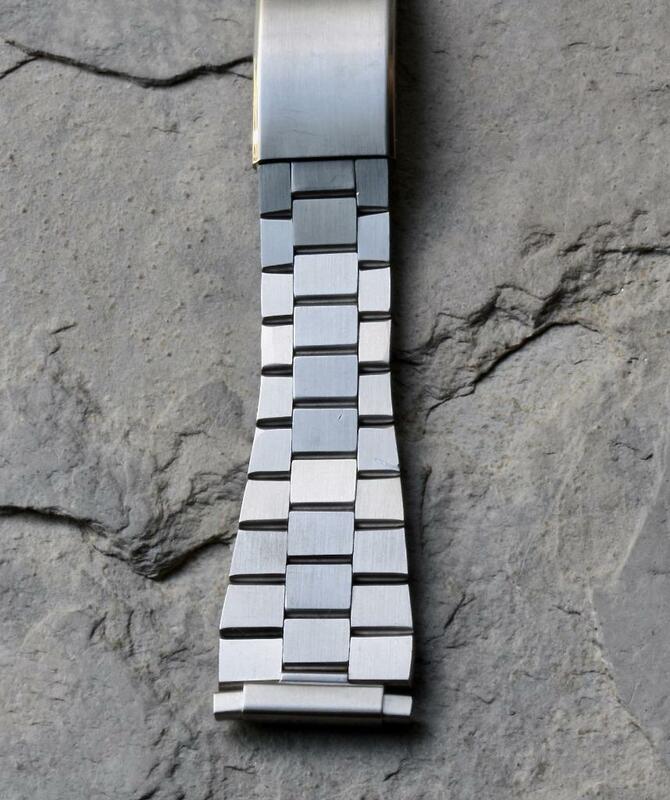 The final link is 22mm wide to make a smooth, gradual transition to the Heuer Calculator large case. Other straight-sided bands wind up looking too skinny on large divers and chronograph watches, but this one has nice, wide links. Plus this unsigned band has a completely matte finish to the satin steel to match the Calculator case and matte bezel. The clasp is 17.4mm wide. The links are 3.0mm thick. Please note this is a modified item; the last link on each end has been slightly narrowed to 22mm. 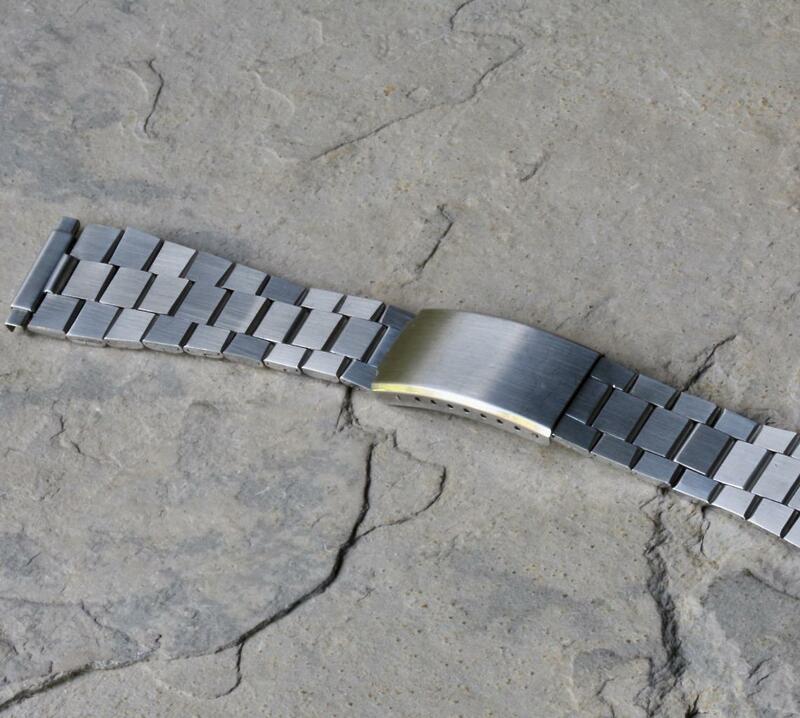 This bracelet could also work on many 22mm vintage dive watch or chronograph models. This is a good length band that will fit many wrist sizes. Fully extended the band measures 6 3/4 inches (16.7cm) and it sizes down to 5 7/8 inches (14.8cm) with the 7 incremental length adjustments in the clasp. 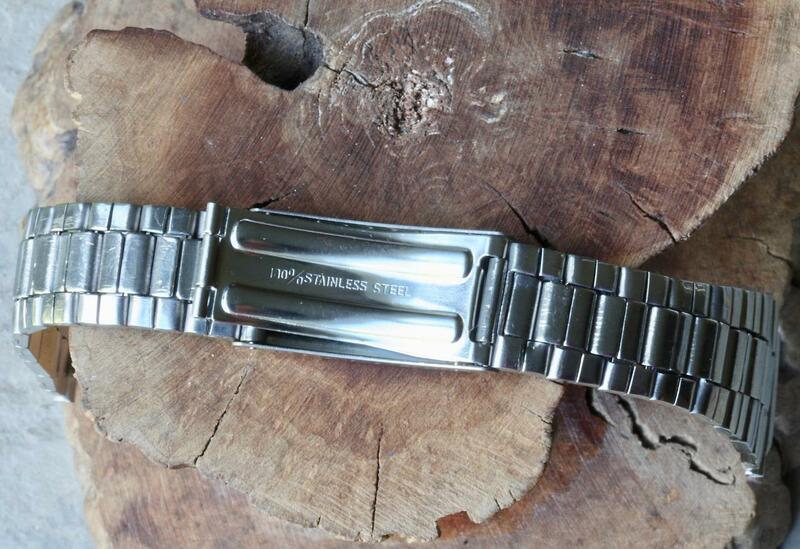 Marked "100% Stainless Steel" on the back of the clasp. U.S. buyers pay $6.99 for First Class shipping or $13.99 for Priority to arrive in 2-3 days. International buyers pay $40 for Registered First Class for any number of bands bought at the same time. 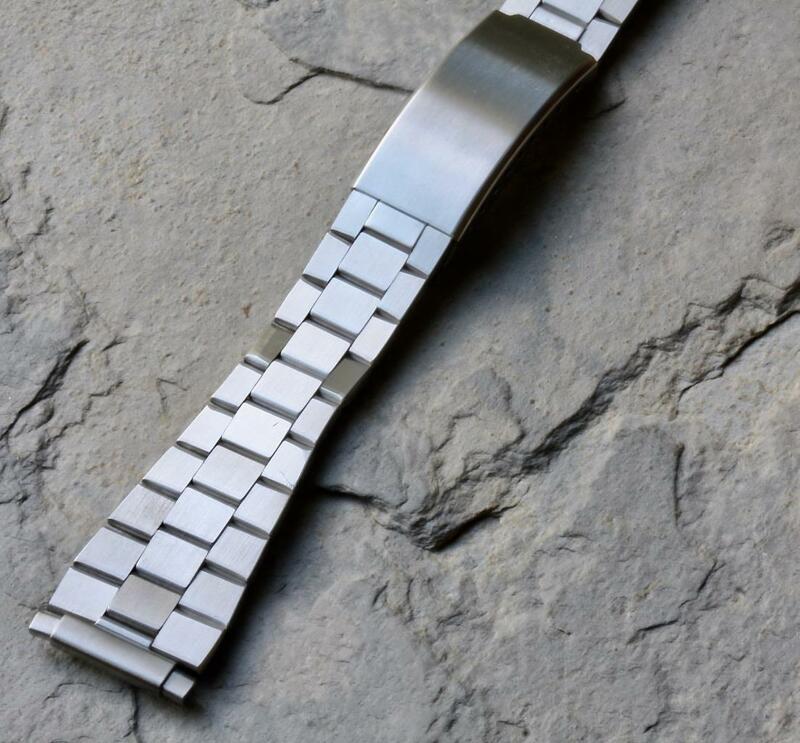 We are also offering the same bracelet with fixed 19mm wide ends for $225, a version with 23.7mm wide final links and also another style of flat-link bracelet to get virtually the same look as the famous Omega 1035, 1039 and 7912 flat-link bands original to Omega Speedmaster and Omega Seamaster 300. Email billmahoney@aol.com for more details.